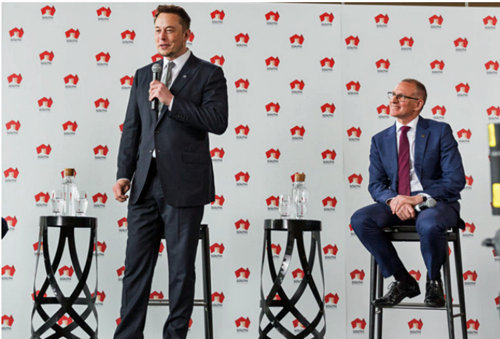 SpaceX and Tesla CEO Elon Musk was recently in South Australia to announce its 100MW Tesla battery project alongside South Australian Premier Jay Weatherill.Photo is courtesy of Andre Castellucci/InDaily. After weeks of rumors, the confirmation has been received that Elon Musk will speak at the International Astronautical Congress (IAC) in Adelaide at the end of September. Musk hinted at revealing his latest Mars plans in Adelaide when speaking at the International Space Station Conference in Washington DC two weeks ago. According to IAC organizers, Musk has since been locked in to speak to delegates on the final afternoon of the congress on September 29. IAC 2017 CEO Brett Biddington AM said Musk will speak for an hour, including a Q&A session and the talk will be live-streamed on social media. Biddington said Musk’s decision to update the global space community about his plans to colonize Mars would be welcomed by delegates to IAC 2017. Although the final day of the congress is open to the public, only registered delegates will be eligible to attend Musk’s talk in person. “Younger people especially are inspired by Musk’s innovation and entrepreneurship and the opportunity to hear of his plans first hand is a rare privilege,” Biddington said. The 68th International Astronautical Congress will be held at the Adelaide Convention Centre in South Australia from September 25 to 29 and is set to attract around 3,500 international and local delegates, including the world’s leading space agencies. The South Australian government is developing a space industry and has enlisted 11 local space start-ups, including Myriota, Fleet Space Technologies, Neumann Space and Inovor Technologies, to increase their footprint in the multi-billion-dollar global space industry. Musk visited Adelaide earlier this month to announce the partnership between his company Tesla and French renewable energy company Neoen for the 100MW/129MWh battery at Neoen’s Hornsdale Wind Farm in the state’s Mid North. Story by Jim Plouffe, THE LEAD.